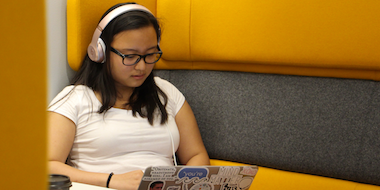 After spending my sophomore and junior years working on assistive technology projects with Northwestern University’s Inclusive Technology Lab, the opportunity to explore accessibility research at IBM was an exciting introduction into the industry. I worked on everything from server configuration to front-end development to design research interviews. This broad range of experience made for a fruitful summer. 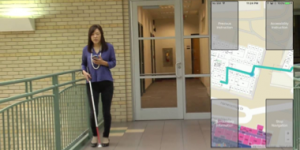 Created at IBM’s Tokyo Research Lab under the direction of Dr. Chieko Asakawa, NavCog is an indoor navigational system that uses Bluetooth Low Energy beacons and an iPhone to give blind users turn-by-turn directions through indoor spaces. Working with TRL, I set up NavCog at IBM’s Austin location, learning the system from the ground up. By the end of July, I had set up servers, placed beacons, and planned routes to demo NavCog in Austin’s Think Lab. Beyond learning the technical aspects of NavCog, I led a team of new hire designers and offering managers in redesigning NavCog through the IBM design Patterns project. 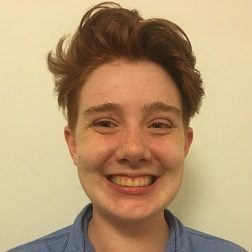 We collaborated with five blind users to learn about their experiences of navigating airports, and I participated in hours of design research interviews. These users brought immensely valuable input to the design team, and the time I spent talking with them has forever changed what I notice when I walk through an airport. It was incredible to help this team move from having to point of reference for accessible design to producing a voice interface and user interface where all the design decisions were driven by a desire to be accessible. You can learn more about this project by reading the team’s blog post. Along with learning about NavCog, I also dove into web accessibility by designing a tool to auto-generate accessible color palettes. Beginning with the IBM design language color palettes, I sought to automate the process of generating a set of color palettes to meet WCAG color contrast guidelines. 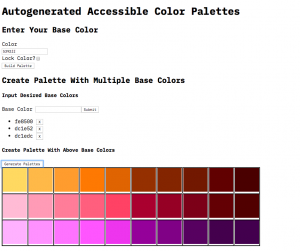 These palettes all take a base color and generate a set of 10 labeled shades of that color, and any shades that are 5 apart will automatically meet accessibility guidelines. 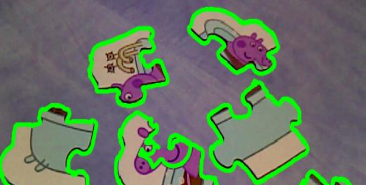 I was able to build a tool that would take any number of base colors and then auto-generate shades of those colors that would meet this accessibility constraint. Creating this tool was a fascinating combination of front-end development and algorithm design, and I improved my skills in both arenas. This design allowed me to really study how to bring accessibility considerations into the creative process of building online content, and it was exciting to try to help break down the perceived barriers between creativity and accessibility. While I spent most of my time on my individual projects, I absorbed so much as part of the Accessibility Enablement Team. From learning about the work my colleagues do to participating in daily meetings, I was able to really understand what it takes to implement accessibility at a company as large as IBM and gain a new appreciation of what a commitment to being accessible takes. I learned so much over my 12 weeks at IBM and will take these skills with me into a career in accessibility.